so I wanted to encourage you. THANK GOD FOR CLOSED DOORS. CUZ PRAISE GOD I HAVE ROLAND NOW. but I'm SO GLAD GOD CLOSED THAT DOOR IN MY FACE.. 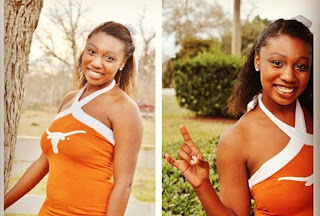 I tried out to be a UT Cheerleader, because I wanted popularity, fame, notoriety, to be 'somebody', even though Christ had made me someone in Him. I wanted to be lusted after. I wanted to be 'one of them.' Their life seemed so perfect. I HAVE YOU RIGHT WHERE I WANT YOU. I also applied to be a writer on this Christian blog. My stories and about me were great, but I never heard back from them? Was I not a good writer? of course not! I was gifted for this, I have a degree focused on screenwriting! I wouldn't have staciecherill.com and my blog posts and youtube channels! is that blog that didn't accept me bad? Do I want to stunt on them? because He had something better for me!! THANK GOD FOR ALL THESE SHUT DOORS! May we continue to seek your face like never before. May we breath and eat your presence. It's the perfect present to us, Oh Lord. Lord, shut any door that is not in alignment with your Will. so Lord, we humbly submit ALL our life into your hands..
YAY I LOVE YOU JESUS! THANK YOU FOR BIRTHING THIS OUT OF ME FOR YOUR GLORY!